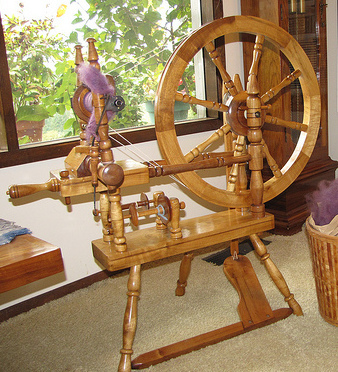 Well, it started with my lovely Joe Jorgensen myrtlewood spinning wheel, which I bought from my spinning teacher. I’d always wanted a myrtlewood wheel and she wanted to sell hers. So. It became mine. Then Ravelry happened. And through it, I learned of a few other owners of Jorgensen wheels. 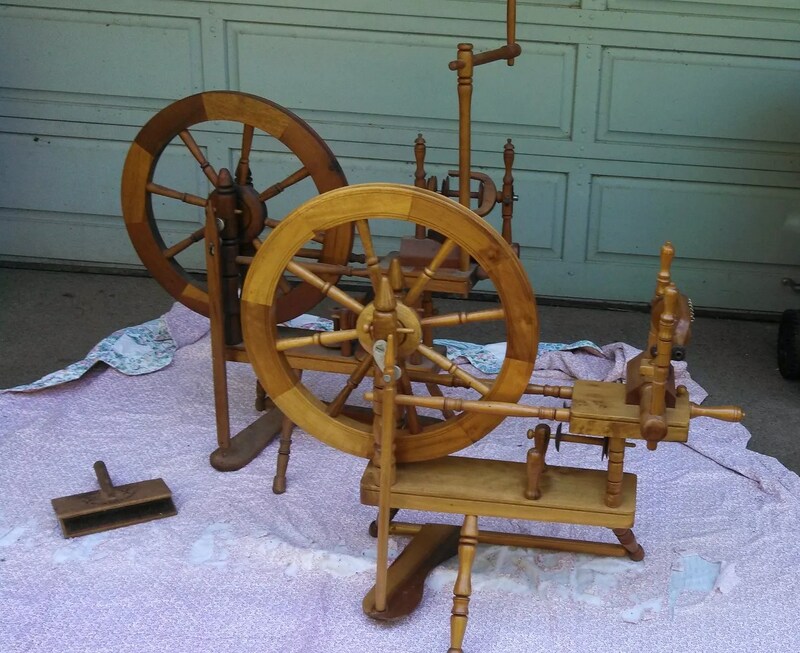 Joe Jorgensen was a man who, till he was quite elderly, made wonderful spinning wheels from myrtlewood. He stamped and numbered (thank goodness!) each one of his wheels. Joe had a shop in Grants Pass, Oregon, and I found out that his wheels were highly cherished by their owners. I decided to start a group on Ravelry, where people who owned, admired, or lusted after Jorgensen wheels could get together. This has led to some wonderful friendships, support, and a real sense of community, and every once in awhile someone new who’s heard about us will join our little group. This has led to the discovery of more of Joe’s wheels. Our goal is to locate as many of Joe’s wheels as we can; a daunting task, because he made over 400 of them! My wheel is #40. 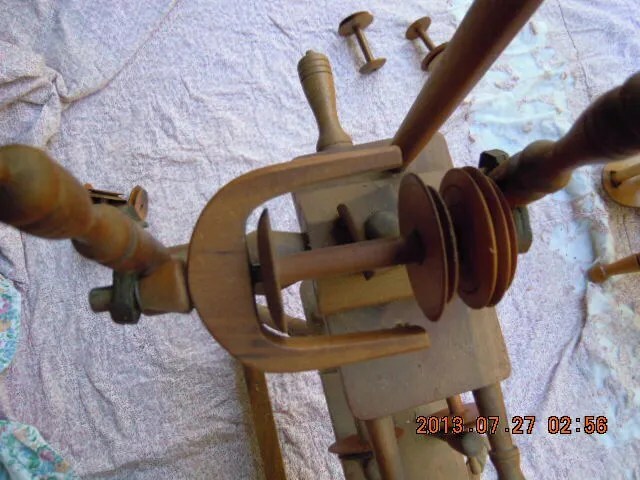 We have learned that Joe did something a little different to each one of his wheels, perhaps in the shape of the treadle, or a couple of decorations he added, or the turnings of the spokes. So far, mine seems to be the only one with double turnings on the spokes; I’m hoping we can find more of them. Okay, so that’s the back story. 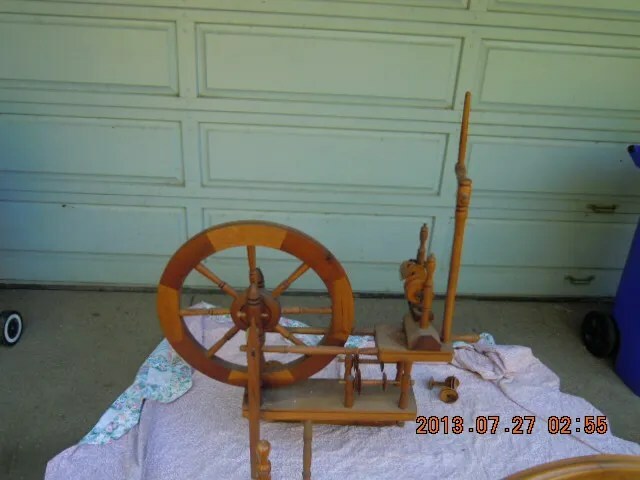 Someone posted in our Ravelry group that he has a friend with two Jorgensen wheels that she wanted to sell, and because she lives only about 45 minutes from me, I decided to go take a look at them. One of the goals in our group is to rescue and/or restore as many of these unique wheels as possible, so I really wanted to see them. Well wowzie! I’d never seen a Jorgensen wheel with a distaff before (that’s the tall thing sticking up on the right end of the one in back). I was immediately very interested. 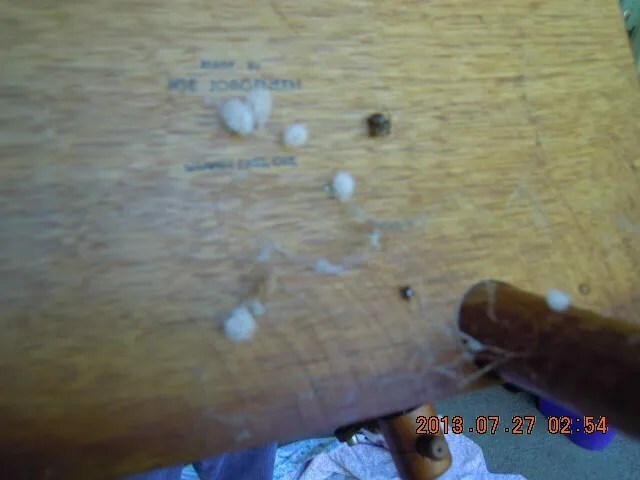 J, the seller, had told me the day before that the wheels had been stored in a barn for over twenty years, and when she turned the first one over to show me that it really was a Jorgensen wheel, I could see the evidence of that. The wheel was oh, so dirty; she’d warned me about that. 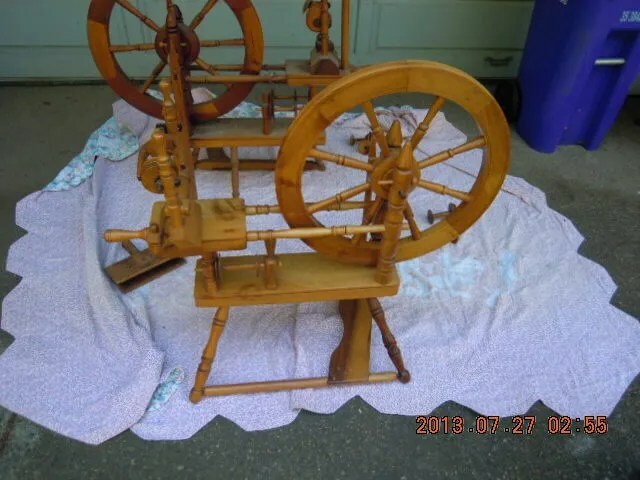 The treadle wasn’t attached, and the mother of all was turned around backwards. But it looked structurally sound, with the exception of some small gaps in the drive wheel. This wheel was stamped #20. 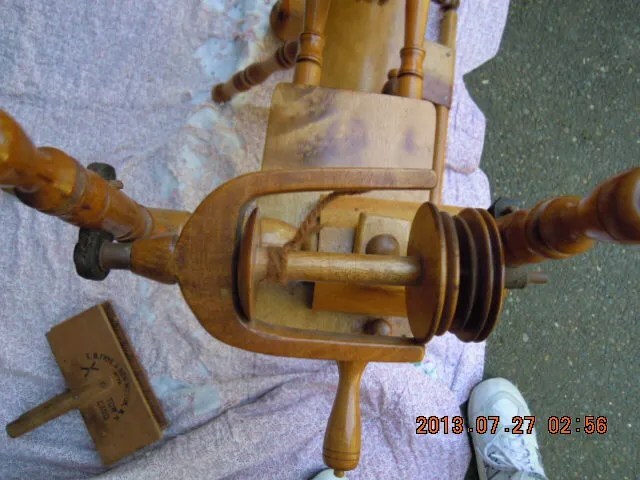 The leather was stiff and old, the tension knob didn’t want to turn, the mother of all (that’s the piece that holds the flyer and the bobbin) didn’t want to stay put. There was no drive band on it and no connecting leather for the footman and treadle. And oh my goodness, the grime! Nolemana started cleaning up a little bit to make sure that #20 could, in fact, be cleaned. In the meantime, I decided to see if I could get #32 to spin. I had to add a drive band (I’d brought along a box of supplies), but the flyer didn’t want to turn and it took a little bit to make that happen. And ho da HOT! 95 degrees that afternoon! But I managed to get everything working after a fashion. This wheel wasn’t nearly as dirty as #20. The grain in the wood was lovely. All the while this was going on, I was sending photos my Ravelry friend Miranda, who also owns a Jorgensen wheel and who knows a lot about wheel restoration. My thought was to maybe get these wheels, clean them up, and sell them (I sure don’t need three Jorgensen wheels! ), but I didn’t want to make that investment if the wheels weren’t worth it. Miranda and I ultimately ended up on the phone, and after talking with her and then with Nolemana, I decided to get the wheels. Yep. Both of them. So in the end, I decided to chance it. Nolemana loaded them into our van, I paid J, and off we went. When we got them home, I took more photos. More tomorrow. Can Mokihana get the wheels to spin well? At all? Wat wen happen???? Oooh, one advencha! Dis is how you hold a babooze in suspense! ARGH – none of the photos are showing but the first one! Desperate to look as well. Sounds super exciting – look forward to the next installment! Can you try again? I’m seeing the photos just fine. I have a Joe Jorgensen wheel that I bought at a garage sale over 20years ago. It’s number 66. It’s in great shape. Have always had it in my house. I am trying to find out more information about it…. etc. Any suggestions? Do you have a picture? I know this was two years ago. I am his granddaughter Jarita. I MIGHT have info. Hi Jarita…. I have a photo and will send it to you. 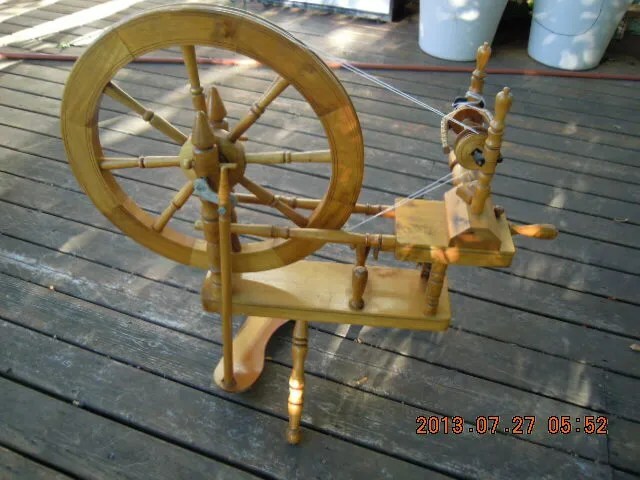 So nice to see grandpa’s spinning wheel creations appreciated in this way! Missed deeply, but not forgotten through his gorgeous woodwork. Very cool Mokihana! I feel so wonderful that I was able to rescue these wheels. Your grandpa did such a marvelous job creating them. Thanks so much for stopping by! I bought my wife a #71 on a household sale a couple years ago. Beautiful condition. It has the double turns on the spokes. She is conquering her loom now. The spinning wheel is next. Hi Mike… thank you so much for letting me know. 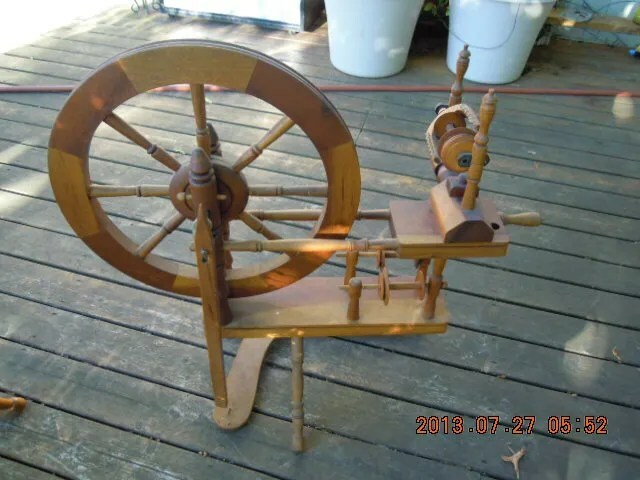 We’re trying to track down all the Jorgensen wheels; is your wife on Ravelry.com? It’s a free knitting, spinning, weaving community. I’ll add your wife’s wheel to our roster there. They are such lovely wheels! When she’s ready, I’ll give her all the help I can with spinning on these wonderful wheels. Please feel free to contact me.